Ok, I moved all of the DLL file from imagemagick\modules/\coders to the root of the imagemagick folder and that worked. I think I had to do that before. Is there a recommended way to configure this? I don't want to put multiple ImageMagick folders in my path. 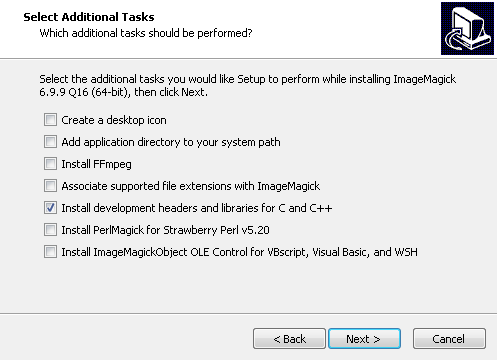 Then you have to put only the core_*.dll's in the imagick folder. The im_*.dll's are automagically found by the imagick extension. Ok, but we deploy this tool using scripts, so I need just files, not to have to run an installer and then remove any pieces I don't use. I've already prepared my deployment using your previous version, but I'll test with the updated php_imagemagick.dll when I get a chance. All builds recompiled with OpenSSL 1.0.2p. Reminder: do not mix PHP 7.2 extensions that use OpenSSL with those of the official builds by php.net, because these are using the incompatible OpenSSL 1.1.0. Updated all versions of PHP 5 as well as PHP 7.0 and 7.1 to OpenSSL 1.0.2q-fips. PHP 7.2.13 will follow suit in 14 days. See https://www.apachelounge.com/viewtopic.php?t=8156 for the OpenSSL release info. For source downloads of PHP 7.3.0 please visit our downloads page. Windows binaries can be found on the PHP for Windows site. The list of changes is recorded in the ChangeLog. The migration guide will be available in the PHP Manual, shortly. Please consult it for the detailed list of new features and backward incompatible changes. I will still be updating my builds for these versions regularly, for instance when dependencies like Curl are updated. Expect new builds after Wednesday December 12 (the next release of curl). Thank you for your effort building PHP with extra extensions in a one pack. I found that v7.3 builds didn't include pthreads and bbcode? pthreads and bbcode were not adjusted yet to the internal changes in PHP 7.3.x. I managed to make them compile now. Please report back if both extensions work as expected. ext/php_wincache.dll is missing in "7.1.25-nts-x64", "7.2.13-nts-x64" and "7.3.0-nts-x64", is because the extension compile error? Ouch. pthreads and wincache got mixed up. 7.2.13 nts x64 is already re-compiled. The others will follow. Except 7.3, because wincache does not compile yet for 7.3 nts. Support for OpenSSL 1.1.0 ends even sooner. One year after the release of OpenSSL 1.1.0 implies end of support at 2019-09-11. I will try to update my 7.0 and 7.1 builds to OpenSSL 1.1.1 as well. I upgraded OpenLDAP to version 2.4.47 in all PHP-versions with OpenSSL 1.1.1 (7.3, 7.2 and the special build of PHP 7.1). Hi Jan, is it possible to include the PECL extensions php_http, php_stem, php_oauth and php_solr in your builds without too much trouble? I could only manage to build the stem extension myself as it is a fairly simple one. I couldn't get the other 3 to build, something about SSL dependencies for oauth and solr, and missing includes for http, that I wasn't sure how to fix. php_http, php_oauth and php_solr are already there. For php_http you'll need php_propro and php_raphf as well. php_stem seems to compile fine for PHP 7.3.3RC1. Which PHP-version are you looking for? x86 or x64, TS or NTS? I'm running Apache/2.4.38 (Win64) PHP/7.3.2 OpenSSL/1.1.1a. You will have to load them in your php.ini before php_http. They are, my php.ini hasn't changed from 7.2 to 7.3 and php_http used to work, so I don't know why the 7.3 version isn't being loaded.